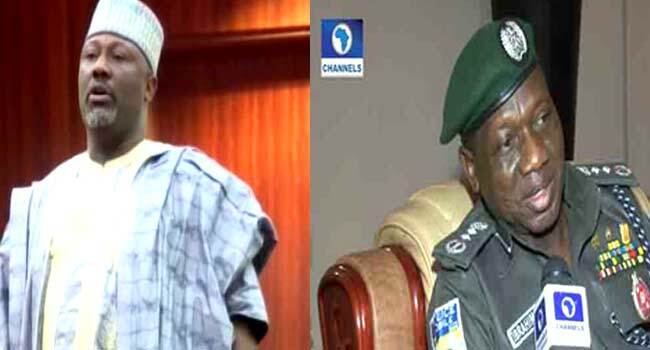 The Senator representing Kogi West, Senator Dino Melaye, has threatened to sue the Inspector General of Police (IGP), Ibrahim Idris. Senator Melaye also gave the IGP 48 hours to produce the two suspects who they police say confessed that the Senator armed them. The Police in Kogi on Wednesday said both suspects and some others had escaped from custody in the morning. Senator Melaye, however, wants the IGP to produce both men and defend the allegations levelled against him by the police. Speaking during plenary on Wednesday Senator Melaye argued that accused persons are presumed innocent until proven guilty. He said it was worrisome that the suspects escaped on a day when they were all scheduled to appear before the Lokoja high court. Senator Melaye’s comments came hours after the police confirmed that the two suspects earlier paraded for illegal possession of firearms had broken free. After their escape, the police declared the Senator Melaye, and seven others wanted. The Commissioner of Police in the state, Mr Ali Janga, who made the announcement in a statement, said others declared wanted are one Mohammed Audi and six suspects who escaped from police custody. The fleeing suspects are Kabiru Seidu (nicknamed Osama), Nuhu Salisu (nicknamed Small), Aliyu Isa, Adams Suleiman, Emmanuel Audu and Musa Mohammed. The suspects had been detained by the Kogi State Police Command in Lokoja, the state capital, pending the conclusion of investigations into their allegations.